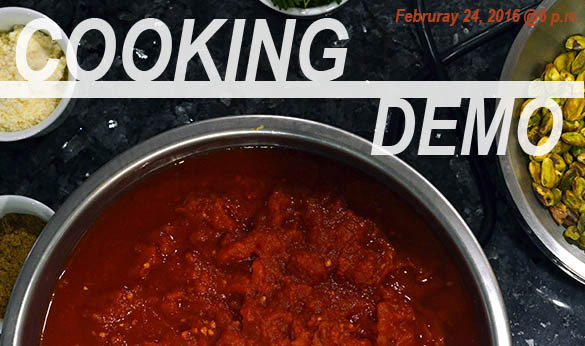 On February 24, Chef Richard Spoon will demonstrate how to make 5 amazing dishes! State Fair and at 17, Spoon organized and prepared a BBQ chicken dinner for 1,400 people at his family’s church. Spoon earned his first associates degree in business. However, the call to further his culinary knowledge led him to Northeastern University in Boston. There he earned his A.A. in culinary arts. At the age 26, Richard became the youngest executive chef of the Winchester Country Club in Winchester, Mass. He refined his talents (including ice carving) as well as trained a group of young cooks ranging in ages 17 to 21. From there, Spoon’s travels took him from California to Trinidad. In 1981, he landed at the Cheshire Inn and Lodge in St. Louis. The Cheshire Inn is known for its fabulous Sunday brunch, stylish catering department (over $1 million per year in revenue), four diamond restaurant, award-winning wine list, 10 horse-drawn carriages, and classic automobiles for special events. Since then, Spoon has been a restaurant critic for the Boulevard Magazine in Kansas City, a winning contestant at the St. Louis BBQ cook-off, a judge at the Memphis in May BBQ cook-off. and the North Carolina Governor’s BBQ cook-off. He also did a children’s cooking show. In 1987, Spoon moved to Knoxville, Tenn. and began working as the Food and Beverage Director at the Holiday Inn. He became a certified general manager and eventually a certified hotel administrator. For the last 22 years, he has managed hotels all over the East coast, mostly notably in Florida. He and his teams have won three Torch Bearer Awards at three different hotels. These awards are given to Holiday Inn hotels that are in the top 5% of their brand segment nationwide. He is currently at the Holiday Inn Express in Kodak, Tenn. Seating is limited, so be sure to book your spot soon. Hope to see you here soon!